Betavine.mobi – Where Are All the Apps? Developers submit new mobile games and applications to Betavine which are then available for download on the web and at betavine.mobi. Users who download the apps can submit feedback to developers using either the mobile or full web sites. This seems like a great idea, users get to try new applications and developers get valuable feedback and exposure to an audience of millions of Vodafone users. There is no cost to developers or users and there don’t seem to be many restrictions on the sorts of apps that are allowed on the portal. Betavine.mobi is a 240 px wide fixed width mobile site that looks good on screens of that width but doesn’t adapt well to larger or smaller screens. The site is a little on the heavy side too, with pages up to 150 KB in size, too large for phones with the Openwave or Motorola MIB browsers. I was really surprised to find only 216 apps and games on Betavine. The files are filtered by device type, so only 130 of the 216 were available for download to my N95. The apps are organized into categories (Games, Travel, “Keeping in Touch”, Health and Fitness, Music Photos, Sport, Business and A-Z) There is no search but with only 130 downloads it’s not a big deal to browse through the categories. I don’t understand the A-Z category, though. I expected it to contain an alphabetical list of all the downloads but instead it lists only nine apps which don’t seem to have anything in common. Anyone can browse Betavine.mobi but to download you must register with a mobile number (for SMS verification) AND a captcha – more security than necessary for a free download site, IMHO. On top of that I never got the SMS. I’m inclined to blame T-Mobile USA for that rather than Betavine. Receiving international SMS seems to be hit or miss with T-Mobile, but that’s another story. Fortunately I was able to log in to the mobile site by using my Betavine.net credentials, an email address and password. The apps on Betavine are a mix of well known ones like Trutap and SocialPlayer that are available elsewhere, demo versions of commercial apps and developer oriented API demos. Betavine.mobi is a nice little app showcase but where is all the content? I don’t understand why there are so few applications and games on the site. Betavine.mobi is an on-deck site for Vodafone subscribers in Germany, Spain and the UK which means 70 million potential visitors. 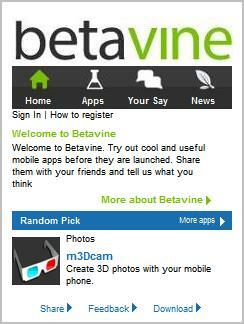 I’m really surprised developers aren’t falling all over each other to submit apps to Betavine. Admittedly there are no paid apps, so no direct revenue opportunity; but shareware, ad-supported and trial commercial apps seem to be accepted. Why haven’t more of the thousands of developers using GetJar submitted their apps to Betavine? Even Phoload, which is only a few moths old, has more aplications. Any developers out there willing to share with their Betavine experiences? Is it difficult to submit apps or are they being rejected by Vodafone? This entry was posted in Downloads and tagged app stores, Vodafone by Dennis Bournique. Bookmark the permalink. Hi Jan – thanks for the tip. MobileRated is awesome! Just got Zelda for my Nokia N95. We put an app on BetaVine and didn’t get many downloads compared to more popular D2C sites like MobileRated.com. I suspect it’s because it just too limited (only Vodafone customers, only some countries, only certain phones), to restrictive (registration require), and poor choice of apps! The last point being the “catch-24” – you can’t get users without apps, and you won’t get the apps without users. On the plus side, the successful D2C companies like MobileRated seem to be doing very well and we’ve been happy with the results there. GetJar also seems to be doing well, but you have to pay to get many downloads there.